A Villanelle and the power of repetition. I took a poetry class a while back where everyone had a personal vendetta against repetition, including me. I thought it was tacky, saying the same word over and over, using the same line. Somehow the greats could do it, but we were not very good at choice repetition. That’s the issue, the repetition needs to be intentional as well as interesting. So using the same word twice is not the same as using the same line 4 times… it was a subtle difference we needed more time to develop. In a villanelle, repetition is your universe. There are rules of course, but the trick is to use the repetition in your favor instead of making the same drab statements over and over and over. The pattern is ABCD BEDF EGFH and so on, until you close the poem with _A_B. So every line gets used twice. That’s a powerful tool to the right idea. Here, I was able to create a moment vs. moment kind of dichotomy, with the first line indicating either present or past, and the second use of that line indicating the opposite. 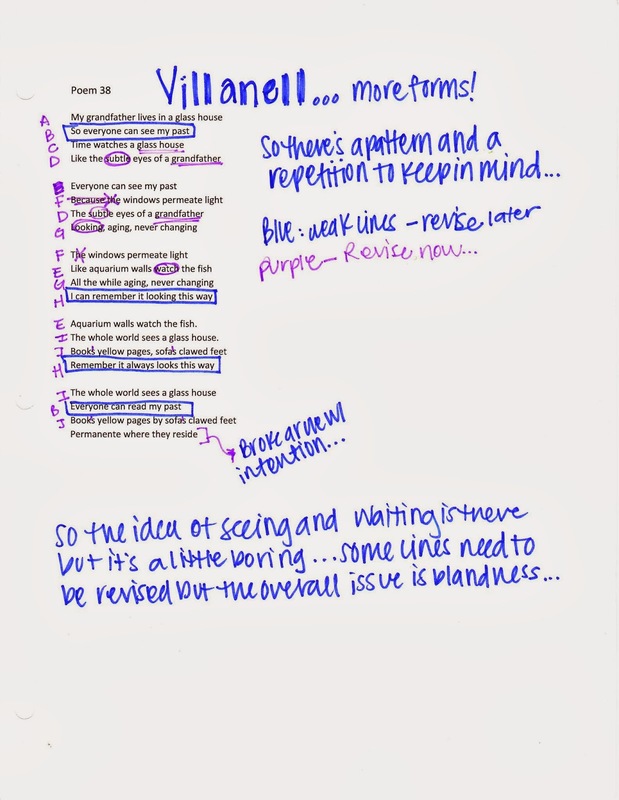 It’s not a hard form to understand, but making a poem both interesting and complex in a villanelle takes some time and editing. In my first version, I tried to incorporate the fish my grandfather keeps as a sort of watching-watching play on perspective. It didn’t work because the poem was too small for both ideas. There needed to be better continuity with the idea of past and watching… Knowing that villanelles can be as long as I want, I could have pursued that idea, but chose instead to focus on the different ways the antiques look as time (day and year) pass by. It made more sense with the two versions of each line. There are ways to revise the lines to make sense, and I find that leaving the big important words and changing articles, prepositions and pronouns is the easiest way to maintain the integrity of the line. There are some instances where villanelles change completely at the end to close off the poem (as seen in my first version). As long as this is done intentionally, no one will be furious… but remember breaking a form should be to better the poem, not because keeping with the rules was too hard. The Villanelle is a great starter form poem for anyone interested. It allows for a length custom fit to the poem and makes repetition accessible to those of us who feel it a bit hokey at times. However, the form is a tool of the poem, and using it to be novel or breaking away without a good reason is a poor use of the structure. Remember that structure should add and never subtract from the overall feel. If you can tell a poem should break away, don’t be afraid to do so… this is the 21st century after all, and we should only follow rules of we want to!